Prepare your child for success in daily school routines with the Special Learning downloadable School Readiness Skills Teaching Tool Kit. 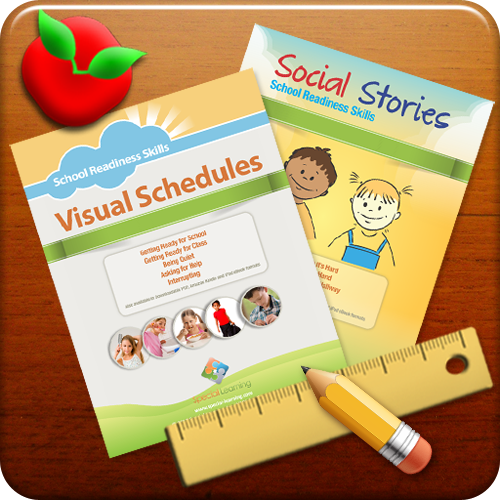 We have bundled two of our most effective teaching tools together, social stories and visual schedules, to help teach children with autism spectrum disorder (ASD) the appropriate social skills to integrate successfully in their environment. Visual schedules are graphic supports that are used to assist children with autism in transitioning between activities, completing sequential tasks, structuring independent learning. Set includes Social Skills Curriculum and Visual Schedule Curriculum. Each book is coded by skill(s) and age to help you determine the most appropriate set to use for your own child. Product available in a Digital Downlodable format.